If you look at mountain bike race results you’ll notice the 40 plus year old race category is one of the bigger fields. Then look at their finish times and you’ll see how incredibly fast they are! If you want to stand on top of the podium in the masters 40 plus category you have to train hard and race smart. Our bodies change as we age. Injuries accumulate that sideline us. Aerobic capacity and lactate threshold fall. We experience a decrease in muscle fibers, strength and lose muscle mass. The biggest impact to training we experience as we age, is a slower recovery rate. Getting old happens, but slowing down in your 40’s doesn’t have to happen too. Studies have shown age-related losses to be inevitable1. You can’t hide from biology. However, the magnitude and timing of these losses are under your control. These studies have also shown that lifestyle has a heavy influence on how fast your age-related decline occurs. If you slow down and adopt an old man lifestyle you’ll backslide on a steady rate. This isn’t your only choice! Following a training plan targeted at mitigating age-related decline factors will reduce the fall-off and even postpone it entirely. We all know some life-long athletes who are still competitive with racers decades younger than them. The big four age-related decline factors to target on a 40 plus masters training plan are; aerobic capacity, lactate threshold, muscle loss and reduced recovery rate. 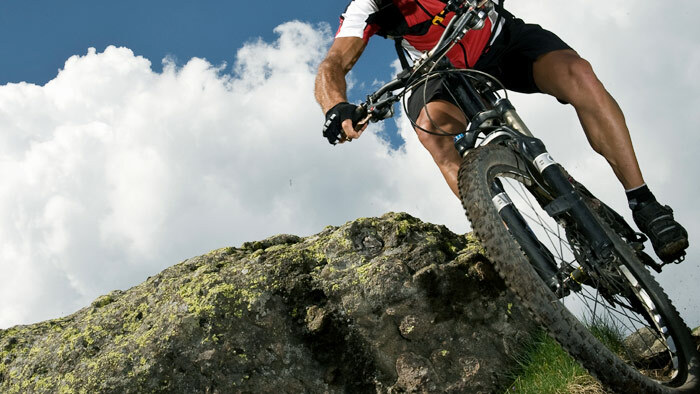 A fifth factor, specific to mountain bike racers is technical riding skill. Strength training should be a year round routine for masters 40 plus mountain bike racers to maintain their muscle mass. In the off-season, focus should be on heavier weights to re-build strength and muscle mass. In the race season focus should be on a reduced volume maintenance program allowing for more priority to be applied to on-the-bike training. Aerobic capacity and lactate threshold should be trained year round by masters. Keep the volume low and frequency to once or twice per week during the off-season, then build volume and frequency as peak races approach. The key is to keep training year round to stop any age-related declines from creeping in. Recovery is the age-related decline that is the most noticeable to athletes. It is obvious when we take longer to recover from a race or hard training ride than we used to. Intense training sessions need to be spread further apart in the training plan to allow for recovery and quality. Recovery weeks need to appear in the training plan more frequently. This means overall, a masters 40 plus athlete can fit fewer high intensity sessions and races into a training plan thus need to hit each one fresh enough to put down a quality ride and make it count. A masters 40 plus athlete should use many tools to speed recovery. The most important is sleep. Aim for 8 or more hours per night and fit post-ride naps in whenever possible. Sleep supercharges beneficial hormone release and recovery. Nutrition is another critical factor. In our 20’s we could absorb sleep deprivation and poor nutrition habits. In our 40’s that will reduce recovery rate, prevent quality training, and undermine your plan. Other useful recovery strategies include ice baths, compression legs, massage, stretching, stress management, meditation, and restorative yoga. Training consistency is a top priority for masters, for which staying healthy is a requirement. As we age we accumulate injuries. Many of us 40 plus racers sport titanium collar bones. The injuries that set us back and never fully heal may need managed for life. Daily stretching, physical therapy and yoga are all appropriate to keep these accumulated injuries from flaring up and throwing us off plan. Always stay below your injury level and choose extra rest plus health, in favor of pushing through any pain or deep fatigue. Planned rest is always better than forced rest due to injury. Technical ride skills can be a great strength for athletes who have been shredding the trails for 25 plus years. This factor is purely a lifestyle factor and you can continue to build downhill speed and technical ride skills well past the age of 40 if it is a regular part of your training routine. Take camps or skills lessons and include technical riding in your schedule weekly. A 20-year-old athlete has different natural abilities and training requirements than a 40-year-old athlete and will thrive on a different training plan. Training changes masters age athletes should make to keep shredding the trails fast and furiously boil down to; more intensity, more strength training and more recovery. Lynda Wallenfels is a Level 1 certified USA Cycling coach. She coaches mountain bike, cross country and endurance athletes to personal bests and national championships. Lynda has been coaching off-road athletes for 16 years and racing professionally for 18 years. Contact her through her website for information on mountain bike training plans, coaching and consulting at lwcoaching.com.